1909 was a special year in the history of Benz & Cie, crowned by the achievements of a record-breaking car which has sealed its place in automotive folklore as one of the most inspirational models ever made. Powered by an awe-inspiring 21.5-litre 200-horsepower engine, the "Blitzen-Benz" reduced the then mythical 200 km/h landmark to a footnote in history. No other road-going vehicle could compete, whilst the world’s fastest trains and even the aircraft of the time were left gasping in its wake. 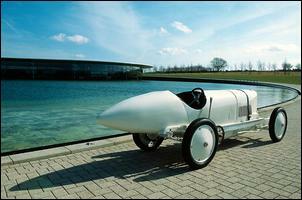 A land-speed record which remained intact for eight years represents a suitable legacy for this era-defining vehicle. Of the six Blitzen-Benz ever made, two survive – Mercedes-Benz owns one, the other is with a US collector. The Benz name is synonymous with the development of the automobile, and with good reason. It was, after all, Karl Benz who on January 29, 1886 was granted the patent which now serves as the birth certificate of the motor car. Just a few weeks later, Gottlieb Daimler’s motorized carriage turned its first wheels. As the 1800s gave way to the final century of the millennium, Benz towered over the world’s auto makers, the cars produced at the Mannheim factory earning an enviable reputation for practicality and reliability. These were relatively rare qualities among the cars populating the roads at the time. A slew of new auto brands had emerged from nowhere, forcing Benz to recognize that a resonant name was not in itself enough to guarantee success in a marketplace with little structure or pattern. The company’s rivals, not least Daimler-Motoren-Gesellschaft, had latched onto the potential of motor sport success as an advertising tool. Despite competing in a series of events, Benz had resisted the temptation to follow suit, preferring to accentuate the virtues of its affordable cars in everyday use. However, after investigating ways of increasing competitiveness, Julius Ganss – a member of the company’s board of management – came to the conclusion that even Benz could not afford to ignore the intricacies of modern market mechanisms. With a thorough appreciation of the qualities inherent in the company’s models, he knew that Benz was perfectly equipped to build a sports car which could outstrip any other form of transport at the time – trains and aircraft included. In early 1909 the board gave the green light to construction of a car which would glide effortlessly through the magic 200 km/h barrier. Providing the thrust to match the rhetoric was the 150hp engine from the grand-prix racer, yet even this output fell short of what was required to fulfil such an ambitious brief. In the hour of need, the engineers fell back on a trusted method and bumped displacement up to 21.5 litres – setting a standard no other racing or record-chasing car produced by Benz & Cie., Daimler-Motoren-Gesellschaft or Daimler Benz AG would ever reach again. The engine developed 184hp at 1500 rpm in its original incarnation, before some technical trickery saw this figure rise to 200hp at 1600 rpm. Weighing in at 407kg, it was almost as imposing in its sheer physical size as in the power it produced. On August 22, 1909 Fritz Erle – a designer at Benz and later head of the testing and motor sport departments – stormed to victory in the one-kilometre race in Frankfurt/Main in double-quick time. Erle covered the kilometre with flying start in 22.6 seconds, equivalent to an average speed of 159.3 km/h and enough to earn him the Grand Duchess of Hesse prize. The car had retained the body of the grand-prix model and entered events under this designation. Victor Héméry drove the 200-hp machine for the first time on October 17, totally outclassing the competition in a sprint race in Brussels. And the tarmac had barely had time to dry on the newly opened Brooklands circuit in England when the Benz works driver arrived on November 8, 1909 to set a new land-speed record. Héméry covered the one-kilometre distance from a flying start at an average speed of 202.7 km/h, breaking the all-important 200 km/h mark for the first time in Europe and proving that the car was capable of fulfilling its raison d’être. This was, after all, a machine built to break records, and other new milestones were soon to follow. The kilometre from a standing start was completed in 31.326 seconds and the mile recorded in 41.268 seconds, equalling the mark set by Darracq. While the car was competing in these early races against rivals and clock, the engineers back in Mannheim were working feverishly to develop a new and aerodynamic body variant. The work was completed in late 1909 and the Benz finally took on a stylistic character very much of its own. Erle and Héméry made the car as narrow as possible in order to reduce wind resistance to a minimum, which explains why the gearshift and handbrake levers - and the exhaust system - were located outside the car body, with only bulges in the hood giving the exhaust rocker arms the space they required. 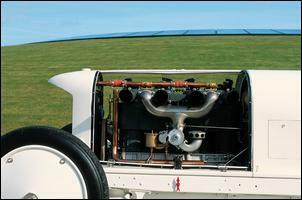 The high-standing, narrow radiator core was accommodated behind a brass grille, whose upper end formed an expansion tank pointing out sharply from the front of the car. This "bird’s beak" helped to give the record-breaking machine its striking and somewhat aggressive appearance, while at the rear of the car, the body tapered off into a pointed tail. When it came to the seat positions, the driver and co-driver – whose job it was to operate the hand-operated gasoline pump – were literally shoulder-to-shoulder. And so, after completing a series of trial runs around Mannheim, the car was shipped off to America in January 1910 - new body and all. The plan was for George Robertson to go head-to-head with the car against Ralph de Palma, who held records on a host of American circuits. However, not everything went according to plan. After discovering that Jesse Froehlich had taken delivery of the car, event manager Ernie Moross proposed a deal with the New York-based Benz importer: his 150-hp grand-prix Benz plus 6,000 dollars in exchange for the record-breaking racer. The wily businessman even had a catchy name in mind – this was a lightning-fast car, so why not call it the "Lightning Benz". The name was painted onto his new purchase. Moross’ driver Barney Oldfield duly lined up at Daytona Beach in Florida on March 17, 1910 without any kind of specific preparation for his first record attempt – and duly posted a new world best of 211.97 km/h. However, the A.I.A.C.R. (Association Internationale des Automobile Clubs Reconnus), the highest authority in car racing and the precursor to the Fédération Internationale de l’Automobile (FIA) which governs motor sport today, refused to recognize the record because the Benz had not covered the distance in the opposite direction as well – as specified in the competition guidelines – with the average from the two runs determining the valid speed. Undeterred, Moross organized a series of show events for the "Lightning Benz". However, the car’s name was soon to lose its sheen in the eyes of its restless owner, who replaced it with the German translation "Blitzen-Benz" – presumably with the aim of further accentuating the car’s roots – and had a small German Imperial Eagle painted onto the right-hand side of the hood. In late 1910 the American Automobile Association (AAA) took the step of excluding Barney Oldfield from all racing activities. In his most recent outings, Oldfield had subjected the Blitzen-Benz to such a severe battering that Moross had to have it repaired. 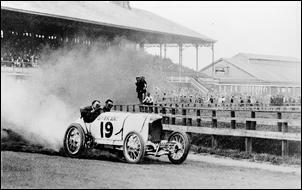 His seat for the following season was taken by the former Buick works driver Bob Burman – to the disgust of Oldfield, who was well aware of the reserves of speed still locked up inside the car. Burman duly lined up at Daytona Beach on April 23, 1911, this long, wide expanse of coastline providing the perfect venue for high-speed trials. Tapping the car’s full potential, he squeezed out an average 225.65 km/h for the mile with flying start and 228.1 km/h over the kilometre with flying start – a new land-speed record which was to remain unbroken until 1919. At the time, this made the Benz twice as fast as an aircraft, whilst the rail speed record (1903: 210 km/h) was also blasted out of sight. The Blitzen-Benz spent the rest of the season decked out in "war-paint", an imposing Imperial Eagle and thick trim lines added to the paintwork. The car was now also fitted with a speedometer, with the transfer shaft located outside the car itself and extending forward to the right front wheel. The Blitzen-Benz embarked on a tour across the USA, becoming something of a sensation on wheels. However, a change in the regulations in 1913 stopped it in its tracks. With displacement limited to 7.4 litres, the legendary Blitzen-Benz I was passed on to Stoughton Fletcher, who hired Burman to carry out the necessary conversion work over the course of 1914. In October 1915, Fletcher then sold the Blitzen to Harry Harkness. On November 2, 1915 the car made its public return, re-badged as the "Burman Special" for a match-up against Ralph de Palma’s Sunbeam at Sheepshead Bay, New York. However, the record-breaking car of years past was barely recognizable, with its wire spoke wheels now containing more tightly arranged spokes, concertina-type dampers fitted in place of spring-loaded shock absorbers, staggered seats, a bulge in the cockpit construction acting as a wind deflector and a significantly longer and more rounded tail which sloped downwards towards the rear. 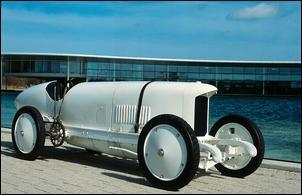 In 1916 Burman was killed whilst at the wheel of a Peugeot, heralding the return of the Blitzen-Benz to Europe. Its journey may have taken it via Mannheim on its way to the Brooklands track in England, where it appeared in 1922 sporting white paintwork, a modified engine cover and a new radiator. Count Louis Vorow Zborowski had taken over the reins, but was unable to pilot the Blitzen-Benz to any further success. In 1923 he tore the car apart and used some of the powertrain components for a new project of his own, the Higham Special. Shortly after the first record-breaking car had been shipped to America in January 1910, the engineers in Mannheim had fitted another 21.5-litre engine (no. 6257) into a chassis/grand-prix body combination. Striking features included the triangular fuel tank at the rear end. This was the model which Fritz Erle drove to victory in the sprint race in Gaillon, France on October 2, 1910, recording an average speed of 156.5 km/h to comfortably top the unrestricted racing car class and set a new record into the bargain. 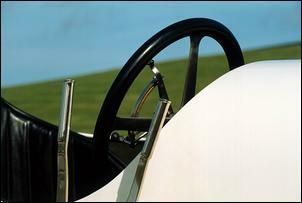 Shortly after his return, Erle had improvements carried out on the car, with the body brought higher up around the cockpit to offer the driver greater protection, spoked wheels with central locks added, the frame endings covered and the two seats arranged parallel to one another. Meanwhile, a second, more aerodynamically efficient body had been constructed for the car in the style of the original Blitzen-Benz and could be fitted to the chassis as an alternative. 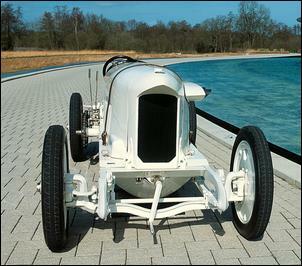 Erle entered the car in a series of races in 1911 and 1912, alternating the body variant from race to race but without being convinced by any difference in performance. This second-generation 200-hp Benz was also shipped over to America, although it is unclear exactly when. What is certain is that Bob Burman competed in a race with the car at Brooklyn Brighton Beach on September 7, 1912 and improved on the track record set by Blitzen-Benz I. The first meeting of the Blitzen took place on September 30, 1912 in St. Louis, where the two 200-hp Benz cars came face to face on the starting line. The event captured the imagination of American sports reporters, prompting rather over-the-top references to the new Blitzen as the "300-hp Jumbo-Benz", even though both cars had the same size engine. The two cars lined up alongside each other for further record attempts on San Diego beach shortly before Christmas 1912, with the second-generation model now also afforded "Blitzen-Benz" status. During the attempt, a fire broke out on one of the cars, presumably Blitzen-Benz I, prompting the quick-thinking Burman to steer it quickly into the Pacific waters to put out the flames. Moross spent 4,000 dollars on restoring the car to its former glory. In 1914 the Blitzen-Benz II stretched its legs over the salt lake in Bonneville, Teddy Tetzlaff recording a speed of 229.85 km/h. The car went on to compete in various races up to 1917, after which things become less clear. 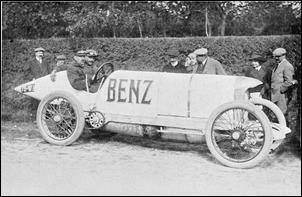 It is likely that the 200-hp Benz was bought in 1917 by Ralph Hankinson, a dirt-track race organizer. However, with his business subsequently entering into bankruptcy it appears that the car was snapped up by a carnival society sometime around 1919. From there the trail runs cold. Work on the third 200-hp Benz ever built was completed in 1912. Once again, Fritz Erle was the man at the wheel as the new car limbered up for the Gaillon Hill Climb in France on October 6. Erle was to further improve his record in the event, notching up an average speed of 163.63 km/h. Driver and car journeyed back to France for the hill climb at Limonest near Lyon on May 25, 1913, Erle taking victory in record time. The car was returned to Mannheim after the race to have the splash lubrication in its engine (no. 9141) replaced with a circulatory lubrication system. It was then that L. G. "Cupid" Hornsted arrived on the scene in Mannheim. Inspired by success in an aging Benz racing car, the British-based Benz dealer had come to Germany to inquire about the possibility of getting his hands on a more powerful machine. The Mannheim management approved the sale of a 200-hp Benz. Hornsted immediately requested a series of modifications be made to the car, including a different radiator grille, a wind deflector and numerous technical tweaks. Bearing blue paintwork, the car made its debut at the Brooklands circuit in November 1913 and the following month Hornsted broke Héméry’s record with a speed of 118.4 km/h for the kilometre with standing start. On January 14, 1914 the Englishman racked up a total of seven new leading marks, including the highest two-way average speed – 199.3 km/h – for the half mile with flying start. Hornsted had already given a demonstration of his driving skill a week earlier, somehow regaining control of the 200-hp Benz after a puncture at around 190 km/h had launched the car into a series of spins. The car was subsequently transported back to the Mannheim plant, where it spent the duration of the First World War under wraps in the testing department. When the fighting was over, the mechanics set about putting together serviceable 200-hp models from the materials available. Two such cars were completed, one of which was based on the chassis used for Hornsted’s Benz and fitted with a reproduction of the Blitzen-Benz II body. Among the distinctive details of the new car were the fully-covered wire spoke wheels, its sharply tapered rear end and the staggered seats. In 1922 it was brought over to Brooklands and presented to Horace V. Barlow as his works car, man and machine promptly roaring to victory in its first outing in August 1922. 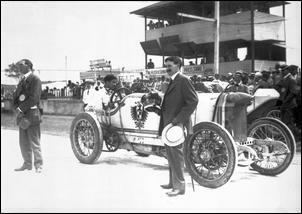 Competing in a different race on the same bill was Count Zborowski in the Blitzen-Benz II. Then, on September 30, 1922, Captain John Duff drove Blitzen no. 3 to a fastest lap of 184.21 km/h in the "100 MPH" short-course handicap race. However, a sudden braking problem caused the car to swerve off the upper edge of the high-bank curve, the resultant impact ripping the car to pieces. The mangled wreckage was transported back to Mannheim. 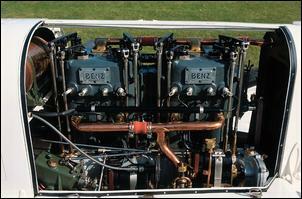 The fourth 200-hp Benz (engine number 9143) came to life around 1912. The latest incarnation sported a broad radiator, wood-spoke wheels and the racing body of the car driven by Erle in 1910/11. The car was entered in several races up to the outbreak of the First World War, with Franz Hörner – a junior driver supported by Héméry and Erle – among those given the privilege at the wheel. The wood-spoke wheels survived beyond the end of the war, giving the car a rather antiquated appearance and earning it the nickname "the grandmother" in its first races post-1918. Appearances, however, proved deceptive, with the Mark-IV Blitzen enjoying a consistent record of success throughout the 1920s. It was then that the car launched its second career as an ambassador for the Benz brand, exploiting the magnetic hold which record-breaking cars exerted over the public at large. A special exhaust system was added to the latest 200-hp Benz to maximize its promotional impact, a flap allowing the exhaust gases either to flow out directly and with an ear-splitting roar through truncated pipes, or to pass through a rather quieter system. 1935 was dominated by a major anniversary at Daimler-Benz. It had been 50 years since the company started to make automobiles and another 200-hp Benz – the car which can currently be found at the Mercedes-Benz Museum – was built from the parts still at hand as an exhibition piece for the celebrations. Some of the components were taken from the "grandmother", others - the hub locks, for example, and probably the radiator and the central section of the body – from the wreckage of Hornsted’s Blitzen. In order to make the car look slightly more aerodynamic, the wood-spoke wheels were fitted with aluminium covers. Plus, the engine cover, rear section and the cover of the truncated exhaust were all newly manufactured. There were still two other 200-hp Benz cars in circulation. Madrid-based Benz dealer Treumann sold car no. 5 (engine number 9145) to Mr. J. Ratis in Barcelona and the customer received his Benz on February 20, 1913. What happened to it next is unknown. Meanwhile, the Benz dealership in Antwerp, Belgium, sold Blitzen-Benz no. 6 to a Mr. M. Heje from Gent, who took delivery of the car on December 24, 1913, thereby setting himself a very special Christmas present. This was the only Blitzen (engine number 13280) with an extended chassis (3200 mm instead of 2800 mm) and a four-seat touring body. The latest model was also a frequent entrant in record attempts at Brooklands. The car remained in England for a long time, before being acquired by an American collector in 2002.